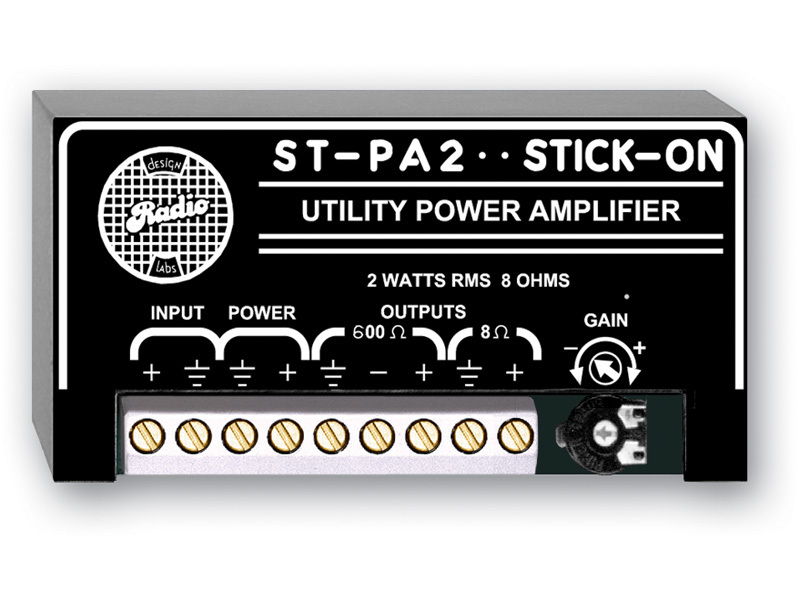 STICK-ONs are the original application-specific modules for the A/V, recording and broadcast industries. Module functions include signal detection, switching, pre-amplification, format conversion, line driving, power amplification, mixing, distribution, gain control, equalization, routing and more. Each STICK-ON is an ultra-compact module engineered to provide higher performance and longer life than other industry products. STICK-ON modules are solid encapsulated hybrid circuits in durable industrial black plastic enclosures (1.55", 3.94 cm x 3", 7.62 cm x 0.65", 1.65 cm) with clear bold white lettering for the terminal block connections, recessed trimming controls and switches. Since RDL first originated application-specific modules, STICK-ONs have led the industry in economical, high-performance and cost-effective long life solutions in system designs. Multiple STICK-ON modules can be interconnected to form all or part of an A/V system. 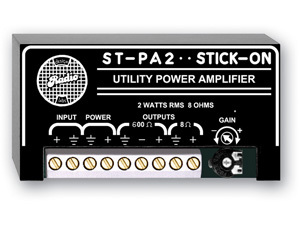 A single STICK-ON module may be mounted right where its function is needed, often to add an input, output, or gain adjustment to existing equipment. STICK-ON modules allow customizing an A/V system to precisely match users’ needs. Adding STICK-ONs to an existing system can extend system life by adding updated features, resulting in considerable cost savings. A complete range of backboard and rack mounting options is available for systems comprised of multiple STICK-ON modules. The technology used in STICK-ON modules has been regularly updated over the years to insure industry-leading performance. Functions and features provided by STICK-ONs, since their introduction, are still available today. This continuity in product offering and support makes STICK-ON modules the preferred long-term resource for system design solutions. STICK-ON SERIES modules are designed and manufactured in the U.S.A.